videoframes is a plugin for tt-rss 1.7.5 or later that enables the playback of videos from Youtube and other sites in Tiny Tiny RSS. For details and installation instructions, please see the github page. Last edited by dxbi on 30 Mar 2013, 23:24, edited 2 times in total. Looks like its working fine here with chrome on youtube clips, thanks for the plugin. Works here as well. Thanks! I've pushed a new version that will replace "old" <object><embed></object> style flash videos with their iframe counterpart. This now accounts for almost all embedded videos I've encountered in feeds. If you come across one that does not show up, please let me know. Are there a new version for TT-RSS 1.7.6? edit: Ok, I found my mistake. I needed to re-download the files. They were cached by a Proxy Server or similar. I got only an older version. I have followed the instructions but I can't see the the plugin in the preferences so I can't enable it. 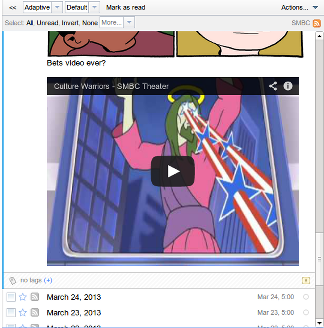 Is the folder videoframes in your plugins folder? Does it contain the file init.php? Does your webserver have sufficient rights to read both files ("chmod 755 videoframes; chmod 644 videoframes/init.php")? I instaled the plugin ( in the correct path, with correct permissions 755 and 644). When i try to configure the plugins, the web page does show nothing, just is in blank. this problem disapears if i delete the plugin. Please check the error log of your webserver and report any error messages. Probably it was my mistake. Now i ipgraded to 1.7.8 and all works fine. Apologize me about the inconveniences. I just found a video that was not rendered in TTRSS. The link to the original article is below if you wish to implement videofeeds for this video source. Great job man! Works perfect. @all If you're following trunk you will have to update to the latest version (adding the api_version spec recently added in tt-rrs). @aldursil Thanks, but I don't think videos from hbo have significant usage numbers in feeds. Eventually I want users to be able to choose which video sites they trust and (temporarily) enable disabled sites using some button embedded into the post itself. But until then, I'll defer adding all but the largest video sources.